Is Rock of Ages fundamentally—OK, for the sake of argument, let’s say entirely—about nostalgia? Sure, it is. The better question is, how is it about nostalgia? If audiences are skeptical about having their past re-fed to them, they should be. The concept of the “jukebox musical” is, after all, built on the curious idea that somehow the warm feelings evoked by a song from the soundtrack of one’s life can be evoked just as easily by a karaoke version of that same song. But the execution of that idea has ranged from the glorious Singin’ in the Rain to the fluffy but inoffensive Mamma Mia! to that cinematic dose of ipecac Sgt. Pepper’s Lonely Hearts Club Band. What would Rock of Ages do with the fist-pumping, lighter-waving glory days of “hair metal” and power ballads? The happy answer is, more than you might have feared. The tone is set in the opening scene, as young Oklahoma girl Sherrie (Footloose’s Julianne Hough) takes a bus to Los Angeles circa 1987 to pursue her dreams of being a singer. As she thumbs through the albums and photos she brought from home, she breaks into Night Ranger’s ode to innocence, “Sister Christian”—and in a matter of moments, all of her fellow passengers have joined in a crescendo of “You’re motorin’.” This is what it feels as though the film—adapted freely from Chris D’Arienzo’s stage musical book—understands right off the bat: There’s something goofily communal about these tunes, and you’d better find a fresh way to approach them. The energy is well-spent on giving new life to the old songs because the basic plot is a familiar shell. There’s a romantic angle as Sherrie meets Drew (Diego Boneta), a bartender at the legendary music club The Bourbon Room who has his own rock & roll dreams. There’s a let’s-put-on-a-show subplot as the Bourbon’s owner Dennis (Alec Baldwin) and club manager Lonnie (Russell Brand) fret over being able to pay back taxes. And for all those who recall the delights of Tipper Gore’s PMRC, there’s a politician’s wife (Catherine Zeta-Jones) mounting a grass-roots campaign demanding that someone please think of the children and stop this dangerous music. But most of the time director Adam Shankman (the musical Hairspray) cycles back to inventive ways to capitalize on our collective familiarity with its songs. The first few bars of an obvious song choice will begin—only to cut off before the lyrics ever start. The lyrics will start—only to be cut off at a point where the lyric itself provides the perfect punch line. The earnest longing of Foreigner’s “I Want to Know What Love Is” underscores two characters stripping each other down and grinding away. In one of the more delightfully perverse readings, the REO Speedwagon schmaltz chestnut “Can’t Fight This Feeling” unites two of the most unlikely characters. Karaoke, this isn’t. The film also has another way of using something familiar in a new way: Tom Cruise. 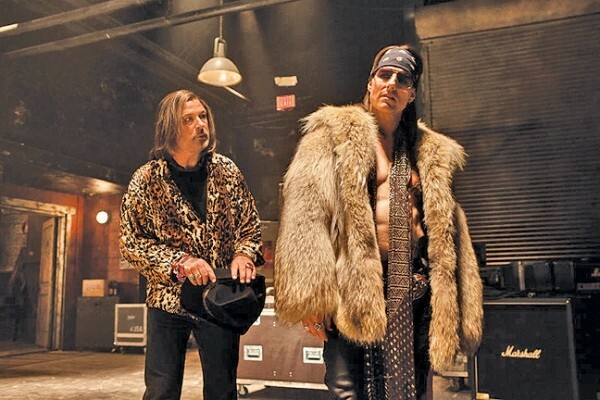 He tears with funky abandon into playing dissolute rocker Stacee Jaxx—spouting nonsensical koans, belting out “Wanted Dead or Alive” and generally embodying fame turned toxic. Cruise has always been at his best playing smaller parts against his leading-man looks, and the level of fun he seems to be having is almost as infectious as whatever diseases Stacee is likely carrying. references to Michael Jackson’s complexion, huge cellular phones and dudes with chick hair, and you’ve got another miscalculation of the creative value of mere reference. It’s fortunate that Shankman, D’Arienzo and company ultimately have as much affection for creativity as they assume we do for the music. When it comes to nostalgia for nostalgia’s sake, we’re not gonna take it. No, we ain’t gonna take it.